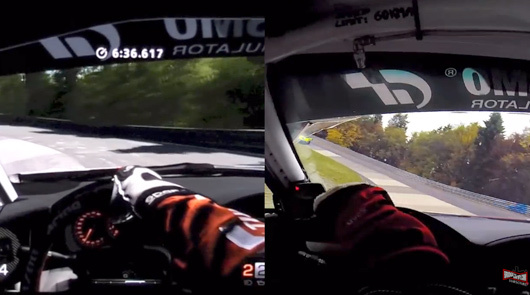 Ever wondered how close the virtual world of the Nürburgring on Playstation GT6 is to the real world? Thanks to Dale from Bridge to Gantry we can show you a driver’s eye view answer to that question. And it’s pretty damn remarkable how close, in lap time, the lounge room Toyota GT86 is to the race-prepped Swiss Racing Toyota GT86. The real footage was filmed during a VLN free practice session. It’s interesting to see how smooth the driver’s hands on the wheel are in the virtual world, compared with the real world where every little bump and undulation is transferred to the steering wheel.